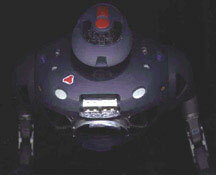 Nick Sadler's LiS (Movie) Robot, reprinted from QSFM. This article originally appeared on Quantum Science Fiction Magazine, and is reprinted with their kind permission. Chances are that if you're reading this page, you've just got your shiny new Robot kit. First of all, CALM DOWN. If you want to get the full potential from this very detailed kit, there's a lot of work ahead. If, like myself, you've only modelled starships before, the Robot kit will bring a fresh challenge and new experiences to your kit building repertoire. Normal practice with starship kits is that the painting takes a great deal of time. Here, in most cases, the painting parallels the building. 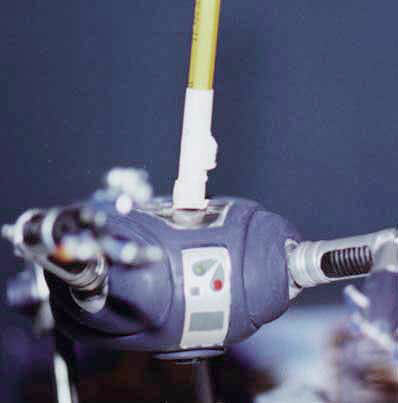 We've all become obsessed with trying to get our tiny kits up to studio model quality, and there are very few pictures of either the Lost in Space Robot, or the Jupiter 2 studio models. 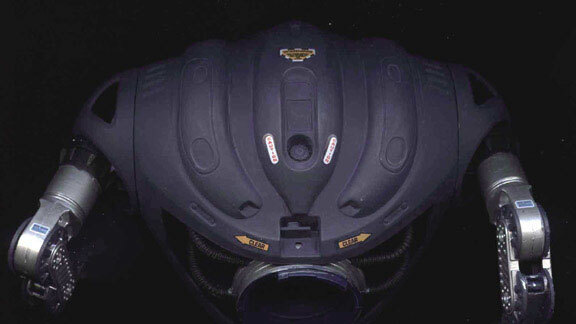 I have managed to find a few pictures of the Jupiter 2, and of the full size Robot at a Lost in Space convention. In this article I will make references to the original ERTL/AMT plan for building, as well as my own photographs in an effort to make things less confusing. As always, the first thing to do is to familiarise yourself with the parts while they're still on the trees. The next step is usually to remove the flashing from around the pieces. As there are a good number of pieces in this kit, it is very tempting to remove the smaller pieces to clean them. Don't! This is how they get lost. Instead, clean the pieces as you remove them, keeping all of the trees - they'll come in handy for a spot of scratch-building later. Early preparations could include giving the large armour plates a few coats of paint. First, decide whether you want the Robot tall or short. I chose to build it tall. Assemble parts 37 together and clean up any open seams with a little putty. Sand with about 800-grit glass paper or silicon carbide paper. Making sure the assembly is dust free, paint it chrome silver. Now glue part 35 to part 36 as shown in the plan. A little seam repair is required around these new assemblies. The rounded end (not the end with the detailed centres) doesn't need much attention as it is hidden later, so just paint them silver. The important parts here are assembly 2A and part 38. These must be joined to the motor units (assemblies 1A and 1B). Be sure that they are painted first (part 38 may need a bit of trimming at the top of the two stems). Choose the positioning of assembly 2A that corresponds with that of the previous step. Now is a good time to check for mistakes, as it is too late to coorect it once the glue has bonded the parts. Paint part 47 as shown on the plans and paint the other two parts involved in this step. If I remember the film, the lower rectangle of part 47 is a display panel ­ Go mad! Next glue this in place on the inside of part 9. (When gluing a painted surface against a painted surface, I use Instant bond cement. Yes it does dissolve the paint as any other type, but it sets much faster). On parts 8 & 9, painting isn't necessary yet on the sides but do paint the top and bottom. Assemble parts 8 and 9 (with part 47) around the short stems of assembly 2B. Putty and sanding is only necessary at the very front and the back for now, however, don't paint over these worked areas yet. These two steps are much the same, the only difference as far as building is concerned, is that 'STEP A' must be completed. 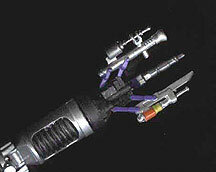 In 'STEP B', the tools don't have to be attached to the end of the arm yet. If they are glued on now, there's a chance that they will get snapped off before the kit is completed. Leave them on the tree for now. For each 'arm', build from the 'hand' to the 'shoulder'. First, paint part 22 and it's unnumbered left-hand side counterpart. For 'STEP A' glue part 27 to 28 (these fit cleanly). Sanding may be needed around the circular joint so that it spins smoothly in the socket. Paint this sub-assembly now. Carry on building the arm as shown, making sure that any open seams are filled and sanded. The ribbed inserts on both of the arms are difficult to sand so take your time. Be careful - the upper arm must be fed through the holes of part 22 before it is joined to the lower arm. The process is much the same for 'STEP B' ­ take care not to fix part 29 into part 50 too well, as the spinning joint won't spin. In this step, that warm lamp takes on a different role. You'll probably find that the two arm assemblies are warped and don't fit against the sides of the lower torso properly. You could use the lamp to ease the plasticity of the part then glue it into place. If this method doesn't appeal to you, just glue the two parts and clamp all the edges to the torso with a length of tape. During drying, the parts may spring away from the torso. If this does happen, add putty to these holes and sand them. Sanding will also be necessary on the top of this entire assembly where the curves meet the straight sides. Once dust-free, the puttied areas can now be painted. The clear piece in this step of the plan can be added now or later. If you choose to add it now, then I suggest using instant bond cement and glue around the edges, not underneath (a mistake I managed to make!). This way, any slip-ups you may make are easily solved ­ and easily hidden! With each edge of this piece glued, it is very tricky to manoeuvre into the space without getting gluey fingerprints on the shiny surface. Tip: cover the flat end of a pencil with masking tape, with the sticky side out, then stick the front of the panel to the pencil. Perform the cementing while the part is attached to the pencil, and glue in place. Cement parts 6 & 7 together. Puttying will be needed around the base and on the side diagonal. The plan says paint the entire assembly silver, but hardly any of it will be seen. Do a 'dry fit' of this assemble with the major front and back panels to see where the part needs painting ­ as metallic paints can't be re-coated, one coat can take up quite a bit of paint, so save it ­ be economical. Add the piping to the sides, removing the flashing from each piece. I wasn't happy assembling both hands closed so I decided to open one up. If you do the same, read on ­ if not, then skip to the PLANS section of this step. 1. Glue each appropriate surface and leave for about 30 seconds. 2. Join them together at your chosen angle, then prop it up, and allow to set for about an hour, or even overnight. Attach them to part 20. 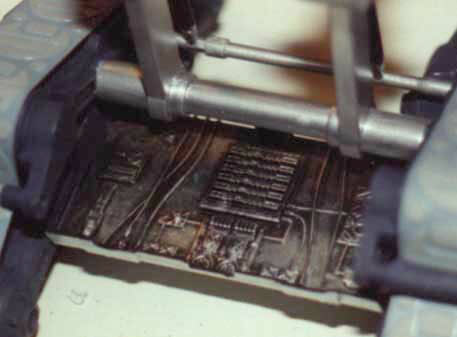 Now use putty to fill the gaps that have been produced. Remember the trees you kept? They come into their own here. Find the part of the tree with the widest diameter and cut three lengths to the same width as the hole beneath the finger. 3. Cut 6 slivers of the same length of tree (this is providing you altered THREE fingers). Attach them to the side of the finger parallel to the other cylindrical pieces, this gives the impression of a mechanical hinge, at the finger base. 4. If you wish to bend the finger at the second knuckle also, as I did, read on. - Saw halfway through the knuckle from the flat side, then fold the fingertip downwards and glue into position. Masking tape is good for holding this in position as it sets. - In keeping with the base knuckle, make a hinge here by cutting lengths of slightly narrower tree and gluing them in where the knuckle bends. 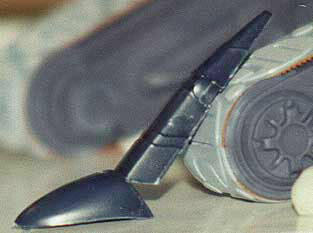 - As on the 8ft 'studio model' the knuckle joints are light and metallic, so paint the knuckle and hinge bars silver. This provides a better contrast and suggests that there is more than one part to each finger, when painted in this manner. 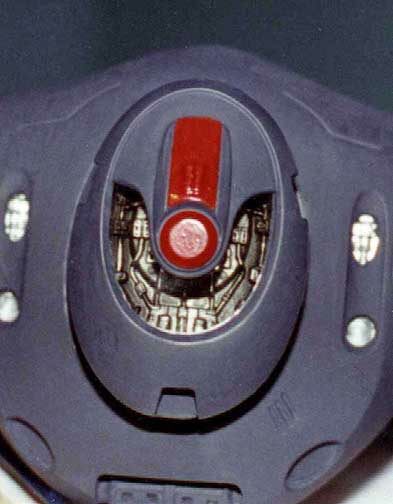 It gives the impression that the knuckles and hinges are all separate pieces. If you followed these instructions, you will need to carve the round pieces on either side of the joint so that it looks circular ­ the straight fingers also need this treatment. - There is quite a lot of flash on the underside of the fingers, small semi-circular protrusions ­ these need to be cut or sanded away. Right, back to business: when building the hands closed, I found it easier to attach the fingers to part #20 and clean up any open seams with some putty. Sand the unit and paint as a whole, the central silver area doesn't present too many problems when painting through fingers. Paint part 49 flat black, and fix part 12 to 13. The plans suggest painting these separate colours, but I haven't found any instance in which this colour difference is visible, so I cemented the parts and sanded the seams away, then painted the unit chrome silver. Do the same for the part assembly 16 & 17. Paint #18 ­ the plans tell you aluminium, however aluminium stands out too much, even though the part is well covered. I used Gunmetal; it's dark but slightly metallic so it stands out enough. Paint part 19, then take the 16/17 assembly and glue it through part 19, to #18. Leave this to dry thoroughly as the fit is quite loose. Now glue this assembly to the upper-hand/finger unit. The seams here are very large so make up the difference in height with putty then use a slightly harsher glass paper to flatten the gradient ­ finish sand with the 1000grit and paint as normal. Masking maybe necessary where the hand meets the silver arm. 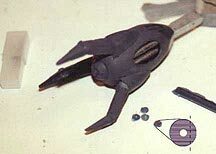 Next, when connecting the two halves of the arm together using parts 14 & 15, make sure the parts are fastened very securely. N.B: The arms are supposed to be fully poseable, but if these joints are weak, the hinges won't support the weight of the arm. 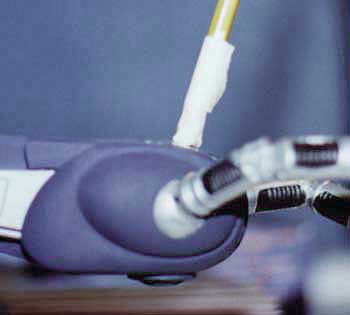 The result is a robot with limp wrists. For my model I picked some dynamic poses and fixed the joints ­ the two that I left unfixed were the joint for sideways movement at the shoulder, and the large circular joint itself. This is a strange step. 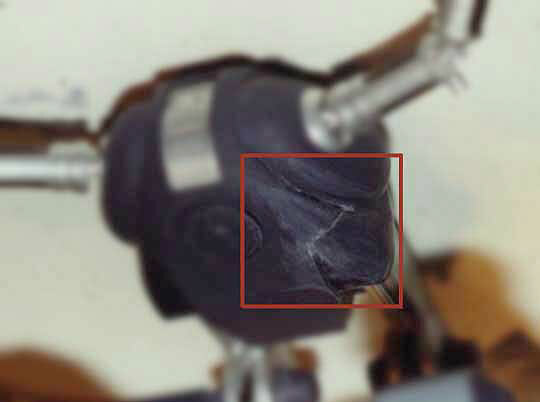 With this method, it's very easy to push the cowl (part #11) too far onto part #10; this almost eliminates any chance of the joint spinning in the socket. I performed a dry fit of the two armour halves with the disc joint in place. This step works better if it is performed at the same time as step 9. - Take assembly #6 and fix it firstly to the front half of the armour (tricky). - Paint parts #10 then put in place and cement the back armour around them to the front piece. - When the assembly dries, fix the seams across the top of the shoulders then paint. 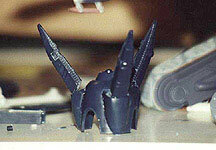 - Paint parts #11 then cement in place ­ be careful not to glue them to the armour. - Now attach the arm assemblies to the shoulder joints. Paint the parts #1, #2, and #3. Paint the inner partition of #2 black and dry-brush chrome silver over it. Now glue the glass to the bottom of #1. Paint the gloss red details onto the front of the head; then when dry, glue to the base. There are large seams underneath the head ­ apply putty to the seams and sand as usual. Cement part #3 to the head and paint that with the freshly puttied areas as a whole. Use instant bond type cement to fix this assembly to the front of the armour. For parts #303, if you aren't lighting the kit, paint the backs white. When dry, glue to the armour using instant bond cement. Some sanding may be needed to get a flush fit. When attaching the torso to the lower midriff I found it easier to remove the front tab from the cylindrical area of the torso. This part is supposed to fit through the circular cut-out in the midriff. Without it there the fit is just as good, but you don't risk snapping the edge of the hole. Decals: everyone has they're own technique for applying decals ­ my advice is to stick with what works for you. I heard of a substance that removes the gloss from them, but I can't find it ­ this would be ideal for this kit, especially if you have used matt paint. Of course, if you're using varnish, then good for you, but if you know where to get this substance then let me know, because I've been searching for years. There seems to be a curious hole at the bottom of the back armour plate ­ I can't find a function so I filled it and sanded it. These steps aren't the definitive, or correct ways to perform the assembly of this kit. They are merely suggestions from an enthusiast. I hope that over these pages I have provided possible methods or inspiration for improvements so that you can find aesthetic looks and effects. If you have any questions, improvements, or if you want pictures then email me at nicksad@cableinet.co.uk. 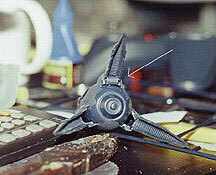 This page copyright © 2000 Starship Modeler. Last updated on 30 November 2000.